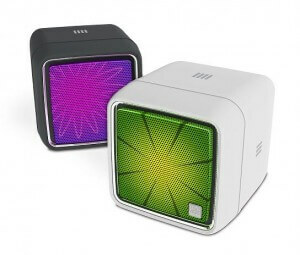 Rotating and tilting the Q2 Cube radio is all you need to do to change stations or volume. As devices become more and more complex, they have the potential to become too difficult for humans to control. Hence we have the new paradigm in technology – simple interfaces for complicated machines. Exhibit A: the Q2 Cube. This new digital radio from Cambridge Consultants and Armour Group can stream internet radio stations but is controlled simply by tilting or rotating. If you rotate the cube onto four of its faces, the radio plays one of four preprogrammed radio channels. Tilting the cube back and forth alters volume. It’s a simple set of controls for a cool product that’s set to hit UK stores for the winter holidays. You can even sign up to win one for free. Engineering an intuitive way to control a machine isn’t easy. Designers barely seem to agree on what a power-on button should look like (thank goodness for that circle with a line in it). The more powerful a machine becomes, the simpler the interface humans may need so that they can focus on managing the tasks performed by the machine. The iPhone has an absurd list of capabilities (acting as a drone remote control being my favorite) but it works using a simple touchscreen. Future human-computer interfaces may rely on humanity’s sense of kinetics to keep things simple. Why mess with a bunch of buttons and dials when you can just shake or tilt the machine to control it? The shaking and tilting of the Q2 is measured by an internal accelerometer which lets it know when to change stations or volume. Unfortunately, the simple set of front-end controls corresponds to a rather complicated back-end. The four stations are preprogrammed into the cube via a PC by temporarily attaching a cable to the radio. An online account (hopefully free) is required to select the internet broadcasts, and the Q2 only works if you have a wireless router for it to connect through. Still, once you set the thing up, the radio is button and dial free. A lack of knobs and keys may not seem a huge selling point for a radio, but it highlights the trend in electronic interfaces: less is better. All of our consumer technology seems to be getting smaller even as it becomes more capable. In many cases there’s simply no room for controls. We will likely see an increase in devices that read the user’s actions to determine how to act, as with scratch input or QB1 computer. For now, the Q2 Cube shows that the human-computer interface can work on a purely physical level. Don’t like the radio station? Just smack the cube and make it roll to a new one. I’ve been using that technique since I was a child.